With more than 20 years of varying experience in business and communications, Mark has delivered his message at local and state conventions, to youth and corporate groups and to the high school and collegiate populous. Armed with a Bachelor of Arts in Communications and Psychology, Mark is a certified facilitator with Lego Serious Play, a Master Presenter with Moovin4ward Presentations and with the Positive Coaching Alliance. 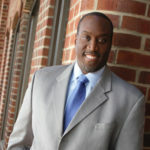 Mark is the Founder of Xtreme Effort Speaking & Consulting. Mark “The Speaker Man” specializes in transforming people in preparation for their success. Through his “Get off the Bench Speaking Series”, Mark has proven results in successfully connecting with his audience. As a result, he has been featured as a speaker for the Future Business Leaders of America, Booz, Allen Hamilton, The Young Professionals of the Urban Leagues of Northern Virginia, The Museum Store Association, and several youth sports leadership boards, and his fraternity, Kappa Alpha Psi Fraternity, Inc.
Mark, an outstanding entrepreneur, has used his business savvy as a former owner of a Cookies by Design franchise and was president of the Franchisee Owners Advertising Association for CBD. Mark is the current Executive Director of the Employee Activity Association, which supports the work life balance of employees in the Intelligence Community.